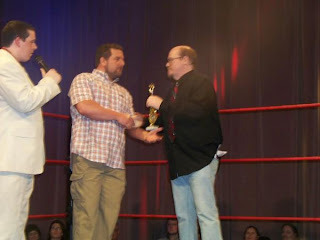 ----The crowd was treated to the RRO Awards Ceremony 2010 before the show. I would like thank all the winners, cast and crew – it makes me feel like all the hard work I do on the awards and the Yearbook is worth it. Alan Steele and Downtown Bruno had my favorite speeches. Thanks guys!! ----Quick note also – these matches are for TV and not all of them are long and designed to be [*****] stuff. 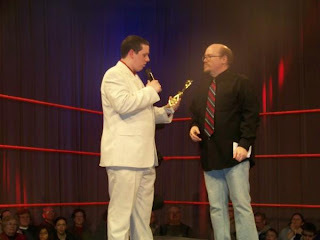 ----Shawn Reed/Johnny Dotson interview. Good very good. ----Nikki Lane beat Tasha Simone. I guess the less said about this match the better. They did not “jell” well. Crowd was surprised to see women wrestling. Sloppy in spots and others spots just not working. ----Kid Nikels – interview. Great interview. Kid is over!! -----Dan Matthews/Kevin Charles interview. Matthews did a solid job here. Charles is usually better, but Matthews was putting over his opponent so much that when the match ended it meant something. 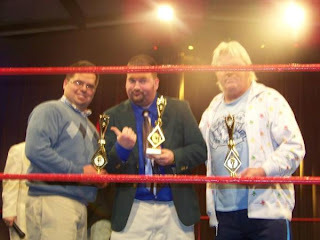 ----“Midnight Gold” [Greg Anthony/Bobby Eaton] with Brian Thompson. A very good interview. This kind of interview would have been money in the old days. -----85+ in the crowd. Crowd was into everything…Chuck Poe and Downtown Bruno both did a great job. They easily are the top two guys in this area…As said, Dotson will hopefully stay around – he fits the style and works real hard. He has got criticism before for things like being “Corey’s pick” or something, but Dotson is a damn good worker. He is very small though, but it doesn’t harm him here with the only real big guy being Nikels….Reed is one of my favorite workers in the area – every time I see him with a partner I want to manager the team. LOL …I am firm believer of putting people in roles they belong – Nikki Lane is great manager and gets over as a babyface in almost everywhere I have seen her. She is not a great wrestler. Tasha has always been decent, but has lost a lot of size and is not that believable…Eaton is the man!! He gives back to this business more than any other guy I know. He was also hilarious after the match. Thompson got in the ring and made them shake hands with the “rookies” [because the rookies here at NEW are BETTER than rookies anywhere else – true] after the win. Eaton kept saying Matthews pulled his tights. Good pop for the win and crowd chanted “NEW, NEW”…Don’t like the name “Prime Danger” [a play off “Prime Time” and “Dangerous” – Charles and Matthews’ monikers respectively]. It is almost like the guys here do a lot of good stuff, but can’t come up with a good tag team name. I never liked “Premiere Brutality”. “Prime Danger” is almost like the “Asylum” deciding to call themselves “Psycho Pappies” or “Pappy Psychos”. LOL…Anthony helped Steele beat up Kid after the match…A really good crew from top to bottom – Kid is super over and will be the STAR of this group. His body seems to be filling out and he works real hard…Steele looks to have lost of few lbs for TV. Another guy in this area that needs a look by the WWE! !